Ok now lets go back to this function right here that we are passing to the "drupal_get_form" function. So again, the "scaffolding_admin_settings" parameter that we are passing to "drupal_get_form" says "go look for a function called "scaffolding_admin_setting" and grab the array that it returns and we are going to use that array for a form. So let's go ahead and look at our inc file here. "scaffolding dot admin dot inc". You can see that our dot inc file here follow a very similar structure to the dot module file. We have our opening PHP tag. We have our commented out ID tag. We have a doxygen style comment here that indicates what our file is all about. And then we have our function that we are looking for. "scaffolding_admin_settings". And we have a doxygen style comment above this that contains just a short description of the function. Now we haven't talked about the forms API yet but this ties in very closely to it. 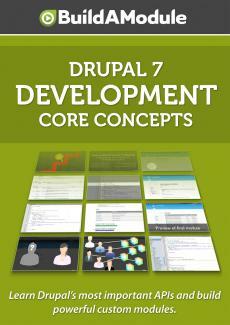 The basic idea is that the way Drupal builds a form is through an array of parameters or settings. This array contains a set of inputs so if we wanted a text input in a text area input, we would have two arrays that contains settings for both of those inputs and those would be included in any container array that's then passed as the form variable to "Drupal_get_form" and then it's rendered. Now what we are doing here is creating a very simple form that just has an example text area input. And then we are running it through a function called "systems_settings_form". What this function does is, is it takes our form array and it adds some resources to it to make it a more full featured settings form so there's a lot we don't have to take care of at the beginning. "variable_get" When go over the form API, we'll discuss this function in particular in detail. Let's go ahead and take this opportunity to look at this form array and what's being passed through the "system_form" function. So first we have our "form" variable, which we can see is an array because we are assigning a key. Another array. The key is the name of the input and so this should be unique for every form element there is. And the array contains a set of parameters that tell Drupal how to render this input. Each one is prefixed by a hash tag to allow Drupal to know that this is a setting and not some other type of data. So the "type" is the type of input and in this case we are going to use a xxxx. The "title" is the label that will display above the input giving an indication of what the input is for. "default_value" tells Drupal what value the input should have to begin with. And this parameter uses the variable "get" function which is a Drupal core API function that allows us to grab data from the variables table in the Drupal database. "variable_get" has a counter part which is "variable_set". And "variable_set" is one of the things that the system forms functions give us.